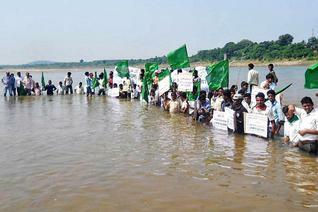 Standing in waist-deep water at the confluence point, the protesters, including women, raised slogans against the project. PAPP general secretary and Adivasi Sankshema Parishad leader Sunnam Venkataramana led the agitation. “We have launched the stir in a symbolic protest against the project, which poses a serious threat to the interests of thousands of Adivasis, large tracts of forestland and above all the rich biodiversity of the tribal areas spread in Andhra Pradesh, Chhattisgarh and Orissa,” said Nehru, coordinator of the PAPP. Speaking to The Hindu , Mr. Nehru said the Polavaram project, if constructed, would not only displace thousands of Adivasis but also cause irreparable damage to their centuries-old traditions. “If the State government is really committed to protecting the interests of Adivasis and the biodiversity of the tribal areas, it should immediately shelve the project,” he said.